Who You Going to Believe on Infrastructure Spending: The IMF in August or the IMF in October? The International Monetary Fund isn’t my least-favorite international bureaucracy. That special honor belongs to the Organization for Economic Cooperation and Development, largely because of its efforts to undermine tax competition and protect the interests of the political class (it also tried to have me arrested, but I don’t hold that against them). But the IMF deserves its share of disdain. It’s the Doctor Kevorkian of global economic policy, regularly advocating higher taxes and easy money even though that’s never been a recipe for national prosperity. And it turns out that the IMF also is schizophrenic. The international bureaucracy’s latest big idea, garnering an entire chapter in the October World Economic Outlook, is that governments should spend more on infrastructure. Barack Obama’s former chief economist supports the IMF scheme. Here some of what he wrote for the Washington Post. …the IMF advocates substantially increased public infrastructure investment, and not just in the United States but in much of the world. It further asserts that under circumstances of high unemployment, like those prevailing in much of the industrialized world, the stimulative impact will be greater if this investment is paid for by borrowing… Why does the IMF reach these conclusions? …the infrastructure investment actually makes it possible to reduce burdens on future generations. …the IMF finds that a dollar of investment increases output by nearly $3. …in a time of economic shortfall and inadequate public investment, there is a free lunch to be had — a way that government can strengthen the economy and its own financial position. Wow, That’s a rather aggressive claim. Governments spend $1 and the economy grows by $3. Is Summers being accurate? What does the IMF study actually say? It makes two big points. The first point, which is reflected in the Summers oped, is that infrastructure spending can boost growth. The study finds that increased public infrastructure investment raises output in the short term by boosting demand and in the long term by raising the economy’s productive capacity. In a sample of advanced economies, an increase of 1 percentage point of GDP in investment spending raises the level of output by about 0.4 percent in the same year and by 1.5 percent four years after the increase… In addition, the boost to GDP a country gets from increasing public infrastructure investment offsets the rise in debt, so that the public debt-to-GDP ratio does not rise… In other words, public infrastructure investment could pay for itself if done correctly. But Summers neglected to give much attention to the caveats in the IMF study. …the report cautions against just increasing infrastructure investment on any project. …The output effects are also bigger in countries with a high degree of public investment efficiency, where additional public investment spending is not wasted and is allocated to projects with high rates of return. …a key priority in economies with relatively low efficiency of public investment should be to raise the quality of infrastructure investment by improving the public investment process through, among others, better project appraisal, selection, execution, and rigorous cost-benefit analysis. Perhaps the most important caveat, though, is that the study uses a “novel empirical strategy” to generate its results. That should raise a few alarm bells. So is this why the IMF is schizophrenic? If you want evidence of IMF schizophrenia, compare what you read above with the results from a study released by the IMF in August. And this study focused on low-income countries, where you might expect to find the best results when looking at the impact of infrastructure spending. So what did the author find? On average the evidence shows only a weak positive association between investment spending and growth and only in the same year, as lagged impacts are not significant. Furthermore, there is little evidence of long term positive impacts. …The fact that the positive association is largely instantaneous argues for the importance of either reverse causality, as capital spending tends to be cut in slumps and increased in booms… In fact a slump in growth rather than a boom has followed many public capital drives of the past. Case studies indicate that public investment drives tend eventually to be financed by borrowing and have been plagued by poor analytics at the time investment projects were chosen, incentive problems and interest-group-infested investment choices. These observations suggest that the current public investment drives will be more likely to succeed if governments do not behave as in the past. Wow. Not only is the short-run effect a mirage based on causality, but the long-run impact is negative. In other words, we have to assume that politicians, interest groups, and bureaucrats will suddenly stop acting like politicians, interest groups, and bureaucrats. But it’s not just a cranky libertarian like me who thinks it is foolish to expect good behavior from government. Charles Lane, an editorial writer who focuses on economic issues for the left-leaning Washington Post, is similarly skeptical. Writing about the IMF’s October pro-infrastructure study, he thinks it relies on sketchy assumptions. The first “if” deals with the Keynesian argument that government spending “stimulates” growth, which I don’t think merits serious consideration. But feel free to click here, here, here, and here if you want to learn more about that issues. The second, and more crucial, “if” is the IMF report’s acknowledgment that stimulative effects of infrastructure investment vary according to the efficiency with which borrowed dollars are spent: “If the efficiency of the public investment process is relatively low — so that project selection and execution are poor and only a fraction of the amount invested is converted into productive public capital stock — increased public investment leads to more limited long-term output gains.” That’s a huge caveat. Long-term costs and benefits of major infrastructure projects are devilishly difficult to measure precisely and always have been. …Today we have “bridges to nowhere,” as well as major projects plagued by cost overruns and delays all over the world — and not necessarily in places you think of as corrupt. Germany’s still unfinished Berlin Brandenburg airport is five years behind schedule and billions of dollars over budget, to name one example. Bent Flyvbjerg of Oxford’s Said Business School studied 258 major projects in 20 nations over 70 years and found average cost overruns of 44.7 percent for rail, 33.8 percent for bridges and tunnels and 20.4 percent for roads. Amen. Governments are notorious for cost overruns and boondoggle spending. It happens in the United States and it happens overseas. It’s an inherent part of government, as Lane acknowledges. In short, an essential condition for the IMF concept’s success — optimally efficient investment — is both difficult to define and, to the extent it can be defined, highly unrealistic. As Flyvbjerg explains, cost overruns and delays are normal, not exceptional, because of perverse incentives — specifically, project promoters have an interest in overstating benefits and understating risks. The better they can make the project look on paper, the more likely their plans are to get approved; yet, once approved, economic and logistical realities kick in, and costs start to mount. Flyvbjerg calls this tendency “survival of the unfittest.” …Governments that invest in infrastructure on the assumption it will pay for itself may find out that they’ve gone a bridge too far. 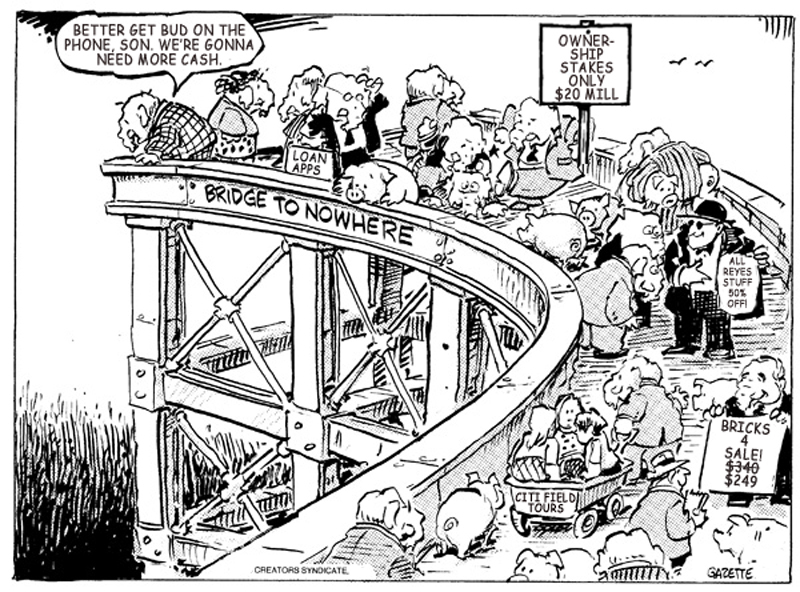 Or bridge to nowhere, for those who remember the infamous GOP earmark from last decade that would have spent millions of dollars to connect a sparsely inhabited Alaska island with the mainland – even though it already had a very satisfactory ferry service. Let’s close with two observations. First, why did the IMF flip-flop in such a short period of time? It does seem bizarre for a bureaucracy to publish an anti-infrastructure spending study in August and then put out a pro-infrastructure spending study two months later. I don’t know the inside story on this schizophrenic behavior, but I assume that the August study was the result of a long-standing research project by one of the IMF’s professional economists (the IMF publishes dozens of such studies every year). By contrast, I’m guessing the October study was pushed by the political bosses at the IMF, who in turn were responding to pressure from member governments that wanted some sort of justification for more boondoggle spending. In other words, the first study was apolitical and the second study wasn’t. Not that this is unusual. I suspect many of the economists working at international bureaucracies are very competent. So when they’re allowed to do honest research, they produce results that pour cold water on big government. Indeed, that even happens at the OECD. But when the political appointees get involved, they put their thumbs on the scale in order to generate results that will please the governments that underwrite their budgets. My second observation is that there’s nothing necessarily wrong with the IMF’s theoretical assertions in the August study. Infrastructure spending can be useful and productive. It’s an empirical question to decide whether a new road will be a net plus or a net minus. Or a new airport runway. Or subway system. Or port facilities. My view, for what it’s worth, is that we’re far more likely to get the right answers to these empirical questions if infrastructure spending is handled by state and local governments. Or even the private sector. What happened to that first stimulus when a diarrhea of dollars was supposed to pay for infastructure and shovel ready jobs? Instead, our mucus minded politicians made sure that those dollars disappeared into their tar pit pockets of wasted spending. Seems there’s a virus in the white house. They call it Ebama. Straight out of Africa from what I hear, but rumors are it may have been locally produced as well. Whatever, It’s eaten through our civil liberties, and is working its way through the constitution now.